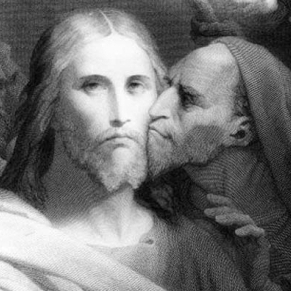 On Great Wednesday the Church remembers how Judas betrayed Christ the Savior. 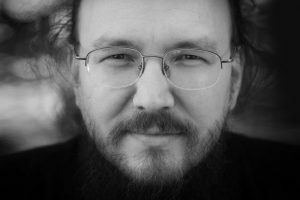 In the following talk, Archpriest Alexander Iliashenko addresses the betrayal of Judas, how Christ was questioned, and the story of Marshal Rokossovsky’s refusal to name names. This serves as a warning to us all that we must guard our inner unity, not allowing ourselves even to entertain thoughts against those of like mind with us or against those people who are close to us, which can ruin a great thing. It amazes me that, as it says in the liturgical texts, Judas was deprived of nothing relative to the other disciples. Everything that the other disciples had, he had too: they spoke with the Savior, and so did he; they went about Judea with the Savior, and so did he; they slept and ate in common, and so did he. Their boat suffered calamity, and the Savior passed by the boat on the waves. Judas saw how the Apostle Peter left the boat and walked on the waves to the Savior, Who was standing on the water. And how the Lord saved Peter – Judas saw all this. The Lord gave him, as He did to all the Apostles, power over unclean spirits. And Judas drove them out, too. It is therefore amazing how this desire for betrayal crept into his soul. Evil always acts subtly. The Apostle John the Theologian says that Judas stole money from this small community (he was the treasurer, to put it in modern terms, and appropriated a certain portion of the money for himself). He also showed self-interest when the sinful woman anointed the Savior’s feet with precious ointment, which he said would have been better to sell and give to the poor. The Apostle remarks that Judas said this not because he cared for the poor, but because he was self-interested. It was this sinful tendency towards self-interest that isolated and inwardly separated him from the other disciples, prompting him to embark on the road to betrayal. Moreover, it should be emphasized that Judas did not desire the Savior’s death. He did not think that his betrayal would end as it did. Judas was also present at the Mystical Supper. 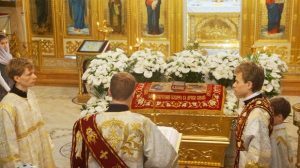 In church, through coming into contact with this mystical and majestic day in the divine services, we experience to our own degree that which took place then. But Judas was an immediate participant, so he also experienced it. He saw the reaction of the surrounding disciples. At the Mystical Supper, when the Savior washed the feet of the disciples, He washed Judas’ feet as well. The Savior, having celebrated the first Eucharist, gave Communion to the Apostles, including Judas. Judas was not deprived of anything, not of the smallest share of the Savior’s attention. But Satan entered his soul along with the blessed Eucharistic bread, and he went out into the darkness from the upper chamber of Sion. When the Savior prayed in the garden of Gethsemane, exhausted and with sweat like drops of blood falling to the ground, the disciples could not bear their weariness and exhaustion. Although the Savior had asked them to watch with Him, their eyes waxed dim and they fell asleep. Judas came to this garden at the head of a detachment armed with swords and clubs, coming for the Savior as though He were a thief. The Savior’s final words to Judas are astonishing: Friend, wherefore art thou come? [Matthew 26:50]. Even at this moment, the Savior extended His hand to him, saying: Friend. But this word did not stop him. People ask if he could have repented. Of course he could have. The Apostle Peter denied the Savior three times. The Savior prepared His disciples, warning the Apostle Peter that this would happen. But the Apostle Peter went and denied Him three times. When he recognized his sin, he repented: he went out, and wept bitterly [Matthew 26:75]. Judas also repented. But, in contrast to the Apostle Peter, who went to the disciples and spent all the rest of the Gospel narrative only with the disciples and especially with John the Theologian, Judas went to the chief priests. John the Theologian was the youngest and the most pure, tremulous, and beloved disciple of Christ. The Apostle John’s love was sufficient to keep the Apostle Paul from falling into the abyss of despair into which Judas had fallen. If Judas had gone to the disciples, and not to the high priests, then his fate could have been different. He would have been understood and forgiven. The Apostle Peter wept throughout his entire life whenever he heard the morning cry of the rooster, reminding him of his betrayal, although the Savior had forgiven him. The Apostle Peter could not forgive himself for his moment of weakness when he denied the Savior. Of course, Judas could also have repented. We do not know how, but the fact is that the Savior did not abandon him; He did not doom him to the fatal deed he performed in desperation. There are different kinds of repentance. There is the repentance that heals the soul, and there is the kind that plunges it into the abyss of despair if one does not have God. Judas could have repented and returned to the shared, grace-filled life of the other Apostles. Judas betrayed Christ in perfect freedom, after some sort of anger or sinful weakness had settled into his soul, which opened itself to temptation. His soul accepted this temptation and rooted itself in it. In his abyss of despair, he could have remembered that the Savior had called him a friend; that an outstretched hand would have pulled him out of this abyss ­– but he did not. He went to the high priests, and not to the Apostles. We can therefore by no means say that his freedom was violated or that he was compelled to do what he did. God’s will was fulfilled, as it should have been – for it is written in the Bible that the Messiah would be betrayed. But all the same, Judas could have acted somehow differently; he could have repented. And his repentance would have been accepted. Returning to the topic of betrayal, I wanted to draw attention to another aspect. I had the opportunity to speak with a general of the militia, now reposed. He was a general in the best sense of this word, a very well-educated man, named Vladimir Petrovich Illarionov. He was from a very traditional and cultured family. As a professional criminologist, he wrote a fascinating book: The Intelligence Services of the Sanhedrin and Caesar Against Jesus Christ. He writes that the nature of intelligence services has not changed over the millennia. Just as human nature is one, so too are intelligence services the same. He lists the methods by which agents are recruited and explains what intelligence services are and how they operate. He notes something interesting: when a criminal is being lead to the investigator, things are done in a standard manner. First, when the person is excited and beside himself, only just having been detained, and is changing from the state of being a free person to that of an accused person, a prisoner, he is asked a simple question: so, tell us about your teaching and about your students. The Savior replied to these questions: “I do not hide; you can ask anyone what I speak about.” Then comes the next step, a standard one: the use of physical force. When signaled, one of the henchmen struck the Savior, saying: “Is that how you answer the high chief”? To which the Savior replied: “If I have said anything bad, then rebuke Me; but if I have said something good, then why have you struck Me?” They were unable to break Him with either these questions or any other. They asked Christ: “Tell us about your disciples,” but He did not name, expose, or betray them! If we call to mind the New Martyrs, they were in fact forced to name names. 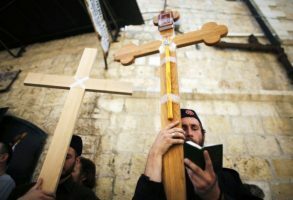 Christ is the begetter of all struggles: long before the New Martyrs travelled along this martyric path, the Savior had already done so Himself. And what could be worse than striking the Savior, Who had healed him? This shows monstrous spite and extraordinary human ingratitude; it is the baseness of human nature plummeted to the very depths. The Savior responded to this entirely unprovoked blow with the great dignity that the He always exhibited, both here and in other circumstances. Rokossovsky did not name names, although in the case of failure he would have had to answer with his head. This is amazing; it astonishes me. This is such a deeply Christian, noble attitude. Everything is hanging in the balance, yet some nobody from the NKVD will not grant him lines of communication in good time. But at the risk of his head, he does not name names. He did not give him up. Konstantin Konstantinovich Rokossovsky (1896-1968) commanded the 16th Army during the Battle of Moscow (October 1941 – January 1942), a defensive effort that frustrated Hitler’s attack on Moscow. To appreciate the full magnitude of the author’s account, it should be borne in mind that Rokossovsky, as a victim of Stalin’s purges, was interrogated under torture by the NKVD (a precursor of the KGB), during which he lost nine teeth, had three ribs cracked, had his toes smashed with a hammer, and had all his fingernails pulled out with pliers. 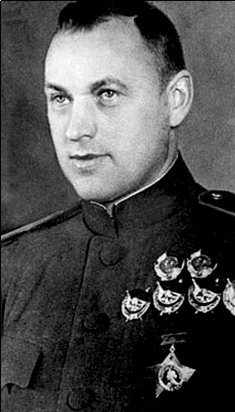 Moreover, Georgy Konstantinovich Zhukov (1896-1974), under whose direct command he was placed during the Battle of Moscow, was his former subordinate.